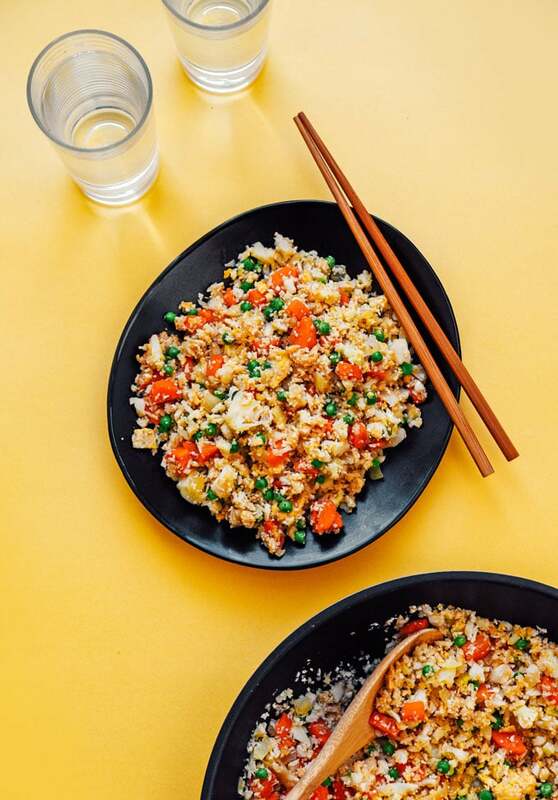 If you’re looking for a low carb dinner idea (or just a plain and simple healthy yet tasty recipe), you’re going to love this guide on how to make cauliflower fried rice! I resisted hopping on the cauliflower bandwagon for a while. But with so many friends (and the general internet) going keto crazy, I thought I’d give the cauliflower faux recipes a try. And let me tell you, they do not disappoint. The Cauliflower “Mashed Potatoes” were fluffy and creamy. The Cauliflower Pizza Crust held up to my critical pizza test. And don’t get me started on the Cauliflower Smoothie (not even joking, friends). And so today I’m sharing one of the easiest low carb recipe swaps, Cauliflower Fried Rice! 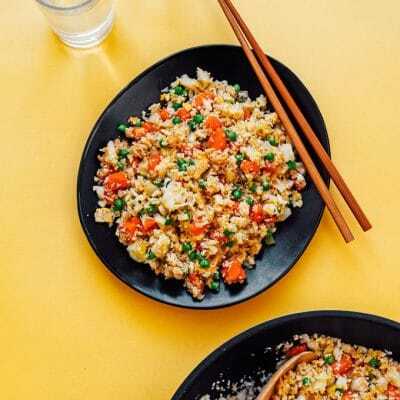 Cauliflower: Cauliflower is the low carb foundation of this fried rice. 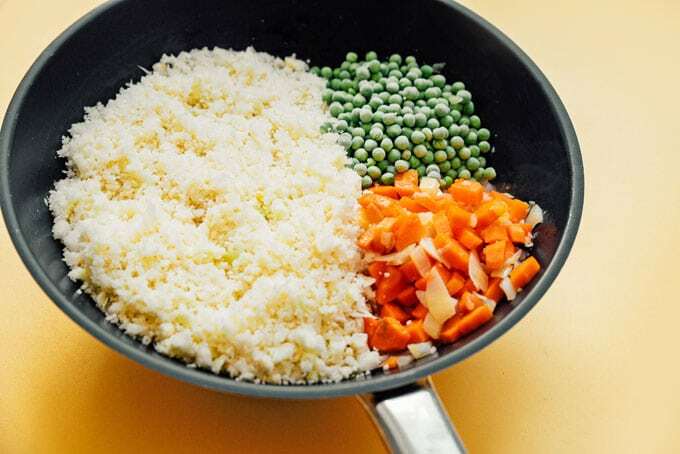 Pulse it in a food processor or grate it with a box grater to create “rice”! Flavor Foundation: Onion and garlic bring instant Asian flavor. Feel free to throw in fresh ginger if you have it! Veggies: As if there isn’t already enough vegetable deliciousness here, we’ll add chopped carrots and frozen peas to spice things up and add some color. 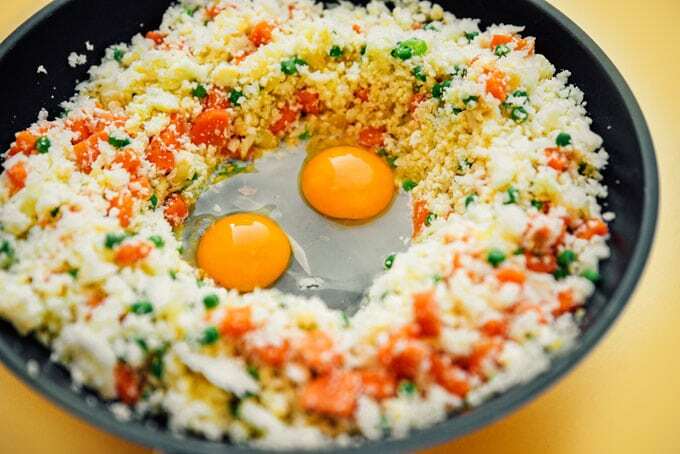 Eggs: Eggs help to make this recipe to be even more filling. To make a vegan cauliflower stir fry, swap out the eggs for scrambled tofu. Finish it off: Drizzle with soy sauce and toasted sesame oil at the end for a final punch of smoky, umami flavor. Ok but…does cauliflower rice taste good? Short answer: yes. Long answer: yesssssss. The taste of cauliflower is masked by a flavor combination of garlic, onion, and veggies, along with toasted sesame oil and soy sauce. The result is a low carb fried rice that’s packed with flavor (but way less carbs). 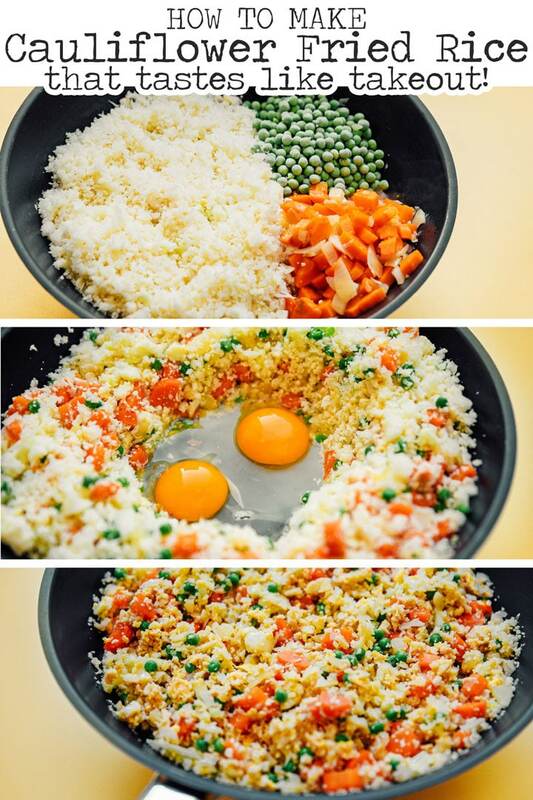 Cauliflower Fried Rice will last 3 to 4 days in the fridge. 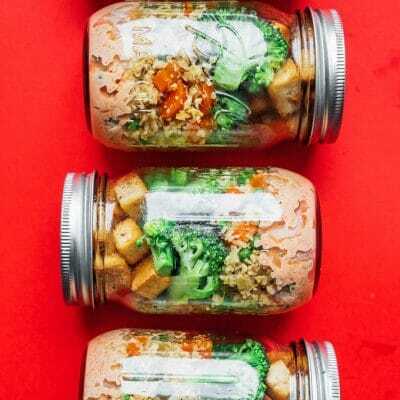 You can also freeze it in a freezer safe container for a few months! When ready to eat, just let it thaw then saute until hot and fluffy. 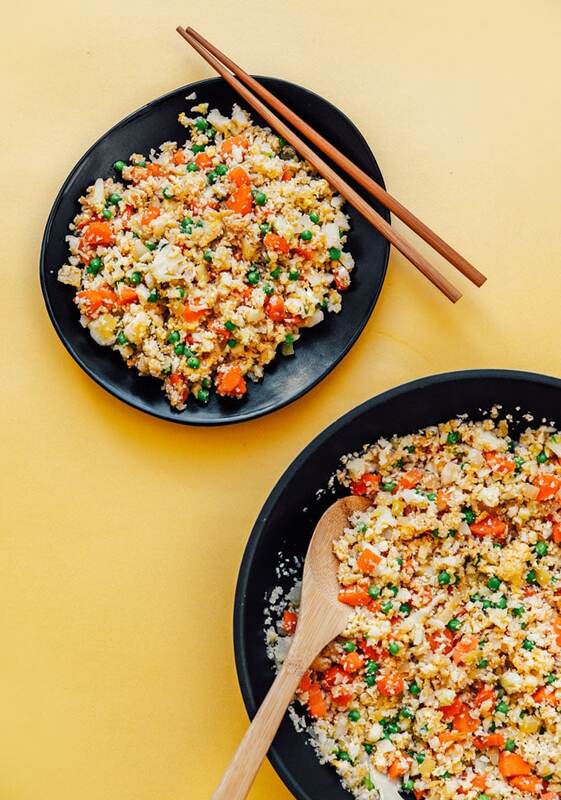 If you’re looking for a vegetarian low carb dinner idea, you’re going to love this guide on how to make cauliflower fried rice! 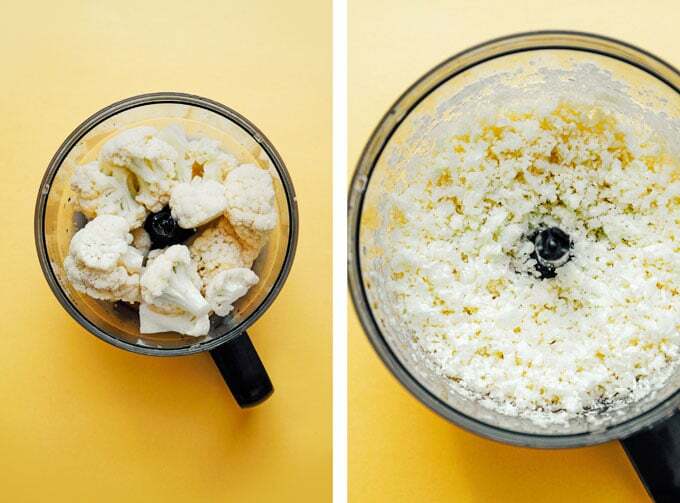 Rice: Cut cauliflower into chunks and throw into a food processor. Blitz a few times until “rice” forms. Flavor Makers: In a large wok, heat olive oil over medium/high. Add onion, garlic, and carrot, cooking until carrot is tender, about 5 minutes. 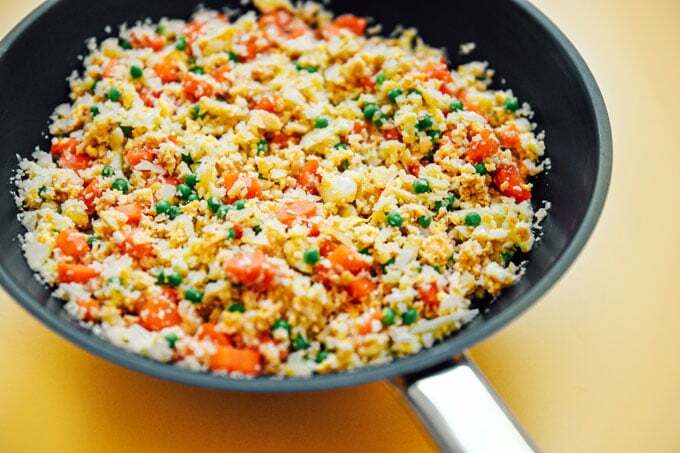 Veggies: Stir in frozen peas and cauliflower rice. Cover and cook until cauliflower rice is slightly tender, about 5 more minutes. Egg: Make a hole in the middle of the mixture so you can see the bottom of the wok. Crack eggs into the middle of the hole and cook them until scrambled, then stir to evenly combine with everything else. Serve: Stir in soy sauce and sesame oil. Serve warm. I first published this recipe over on Amanda’s Cookin’, where I’m a contributor. Thanks so much for dropping by and for making low carb vegetarian recipes like this Cauliflower Fried Rice possible! 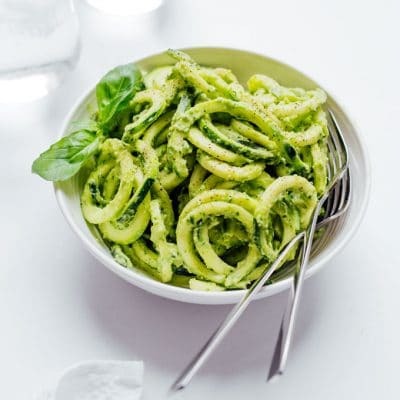 LOVED this recipe UNTIL the carrots and peas which are NOT KETO friendly. I will be doing the rice but NO peas and carrots. Thanks for the tip, Tomie!